The Phillies Nation Top 100 continues today with #42. Our mission is to assess the Top 100 Phillies players of all time using impact to the Phillies, individual achievement, team achievement, traditional stats, and analytics as our criteria. The list was compiled by Ian Riccaboni and Pat Gallen with input from the rest of the Phillies Nation staff. Please check back this afternoon for #41. 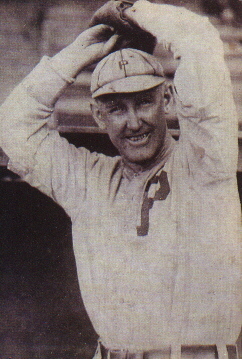 In the 1920s, there was exactly one highlight on the Phillies rather putrid pitching staffs and his name was Jimmy Ring. Through the 1920s, the Phillies went a combined 566-962 (37.04%), winning 62 games or less eight times in ten seasons, including just 50 games in 1923. Ring was acquired on November 22, 1920 for pitcher Eppa Rixey, a name you will see later in this countdown. Ring was the best player on a set of incredibly bad teams while Rixey would go on to have a Hall of Fame career. You win some trades, you lose some: the Phillies of the 1920s lost just about all of them. Ring would be Steve Carlton in 1972 before Steve Carlton in 1972 happened: in 1923, despite his team posting a .325 winning percentage, Ring won 18 games, earning 6.0 fWAR for the season, fifth in baseball, with the eighth most innings pitched. Despite a 3.87 ERA, he was borderline dominant with the 19th highest K/9 IP in baseball. In his first stint with the Phillies, Ring was frequently above-average in terms of ERA, with the NL league average fluctuating between 3.78 and 4.26 and well above-average in K/9 IP. Of any of the players in the Top 100, Ring likely had the most working against him during his stay on the Phillies. From 1921 through 1925, the Phillies were, by almost literally every measure, including Total Zone rating (16th out of 16 MLB teams) and fielding percentage (14th out of 16 MLB teams), the worst fielding team in all of baseball. Ring pitched in front of a team that not only could not physically get to balls but a team that, when they would get to a ball, was highly likely to commit an error on it. Combine that with the ridiculously short right-field porch at the Baker Bowl and it was a recipe for disaster for any pitcher. Yet, some how, some way, Ring surpassed all expectations, his 64-81 (44.14%) mark from 1921 through 1925 seemingly horrible but yet still outpacing by a decent margin the success of his team (36.71%). In decisions that Ring was not involved in, the Phillies fell to a remarkably horrible 217-403. Ring was the poor-man’s 1972 Steve Carlton and quite literally the only bright spot on a set of teams that were among the worst in baseball for the entire decade when offense was exploding in an offense-friendly ballpark.